He said he has confidence in the management of the NNPC and its capabilities to maintain and meet the supply needs of the country, and that the logistics gap which prompted the unnecessary panic has been resolved. But again no system is perfect, sometimes you have some of these things happen but as a responsive and responsible government, alternative arrangements are always in place such that any gap is taken care of not to allow the situation to escalate, he added. He expressed worries that the country has spent so much time dealing with issues around the sector but without tangible success stories to tell. “I want to ask, in human capital development, how can we start building Floating Production Storage and Offloading vessels (FPSOs), develop modules to transfer to the sub-region. When shall we allow market philosophy to drive the market with government providing enabling environment through adequate policies. 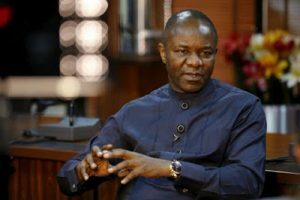 When shall we begin to install our pipelines, build power plants, build our own refineries using in-country resources and attract private sector funding of projects and save government the scarce resources,” he asked.